the physical environment is easy to navigate and safe for people with dementia. Why do we need to talk about Dementia Friendly Communities? 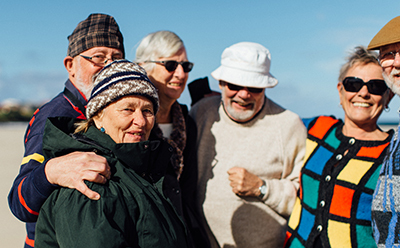 Mainstream community groups and activities are not usually designed to support and include people living with dementia, and the practical tasks of life such as shopping, banking and public transport are not designed to support people with dementia. The Dementia Friendly Communities campaign plans to change this by encouraging organisations, businesses, community groups and individuals to make practical changes that help support people living with dementia to achieve success in everyday tasks and to help them participate in their community with confidence. How do we work together to create a Dementia Friendly Australia? The keys to creating dementia friendly communities are education, advocacy and you. You are a powerful voice for change, and can share a practical vision of a dementia friendly Australia with the people you meet in life and business. First, sign up at the Dementia Friendly Communities hub dementiafriendly.org.au. This is a resource hub for information and tools for dementia-friendly communities, a learning centre providing free online dementia awareness training, and an online community where people can connect and share stories. create dementia alliances made up of diverse people who are interested in transforming their community or town into a dementia-friendly place. create dementia friendly organisations or transform an organisation (including local government and community services) so that operations, procedures and environment better meet the needs of people with dementia. We all deserve to participate and enjoy life without fear of embarrassment or failure. Let’s make it happen together!